After my recent little sojourn into traditional baking with Tudor marchpane, I thought that it would be a nice link to today’s recipe – a fairly simple biscuit flavoured with that rather “olde worlde” flavour, caraway seeds. I love that spice – it is delicious in cheeses and sugary sweets alike, and adds a lovely aromatic flavour to biscuits when you bite into them. As the flavour stays in the seeds, you get little bursts of caraway as you munch on the biscuit. So I set about writing this post thinking that it was another piece of Scottish baking – I assumed, perhaps not unreasonable, that Abernethy biscuits were named after the town of Abernethy in Perthshire (my part of the country, what’s not to love about that?). And according to my mum’s research about our family tree, I think we even have links to the town. Brilliant! Except…well, it turns out that I could not really have been much more wrong! These biscuits are not named after the town, and they’re not even Scottish. They get their name from their creator, a certain Dr John Abernethy. And from what I’ve been able to find out, he was born in London, and grew up in Wolverhampton, and doesn’t seem to have a particular link to the Perthshire town. While Abernethy biscuits remain popular north of the border, it seems that I’ve been under a misapprehension for many years! However, If we ignore my incorrect assumption about their origin, these are actually really nice biscuits. They’re not very sweet at all – just a little bit of sugar in them – as they were created as a sort of “digestive” biscuit. And that’s the point of the caraway. The seeds were traditionally regarded as aiding the digestion and settling the stomach, hence their appearance in these biscuits. Given this claimed health benefit, it begins to make a bit more sense that Dr Abernethy is hailed as their creator. We can only assume that they must have enjoyed quite some success as they went on to become quite famous. These biscuits are very simple to make – rub butter into flour, add sugar and spice, then a beaten egg and some milk to make the dough. Then roll it out, as thin as you can, and cut into circles and then…well, this is where the fun starts. You can leave them plain, you can spike them with a fork, you can use one of those special things-with-nails-in-them to get perfectly identical biscuits, or you can do what I did – cut the tip off a wooden cocktail stick, then make the holes at random. You need to develop a good press-twist-pull movement, and forget any idea about getting the pattern perfect – aim for random, it’s less likely to drive you mad when you’ve punched holes into the thirty-four biscuit! Abernethy biscuits are nice on their own, not too sweet at all and with a good caraway flavour. Perhaps the best way to describe them is like a less tender version of shortbread – they’ve got a definite snap to them. They go well as simple accompaniment to a cup of tea, but they are also great to serve with cheese. I found a good, strong cheddar worked particularly well. 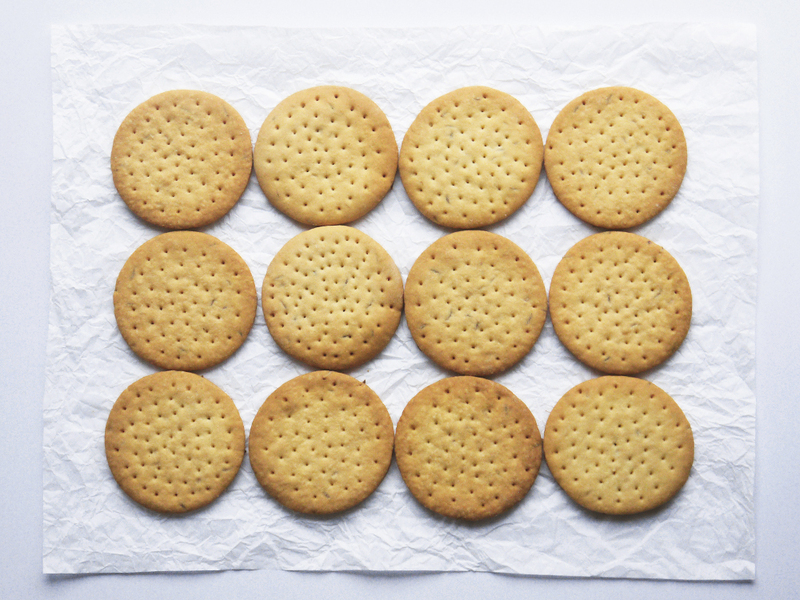 If you prefer to use them as a sweet biscuit, you can dust the baked biscuits with caster sugar straight from the oven. Or ice them for a sort of mock-Tudor delight (I have not tried this – but if you do give it a go, let me know how that works out). Now…I just need to see how well I sleep tonight. I’ve wolfed down a few of these biscuits today, so I am fully expecting my stomach to be quite well settled, and that as a result (and thanks to the work of Dr Abernathy) I should sleep like a log! 1. Mix the flour and baking powder in a bowl. Rub in the butter until the mixture looks like breadcrumbs. Stir in the sugar and caraway seeds. 2. Add the beaten egg and a tablespoon of milk, and stir to make a soft dough – but it should not feed sticky. Add more flour or milk as needed. Wrap in cling film and chill for 30 minutes. 3. Preheat the oven to 180°C (355°F) and line a baking tray with greaseproof paper. 4. Roll the dough thinly on a floured work surface and cut into rounds. If you want, use a cocktail stick to make a pattern on top. Keep going until you have used all the dough. 5. Bake the biscuits in batches so you can control the colour and prevent them from getting too dark. Bake for around 10-15 minutes until golden, turning the tray half-way to get an even colour. Worth making? I love these biscuits! The caraway is a very unusual flavour, and the lower sugar content makes them seem just that little bit more refined.